Ely has 20 murals that depict its rich heritage of mining and ranching, along with the people who called this part of eastern Nevada home. The Cherry Creek Hot Springs mural has just been refreshed with fresh paint, 17 years after it was first painted. 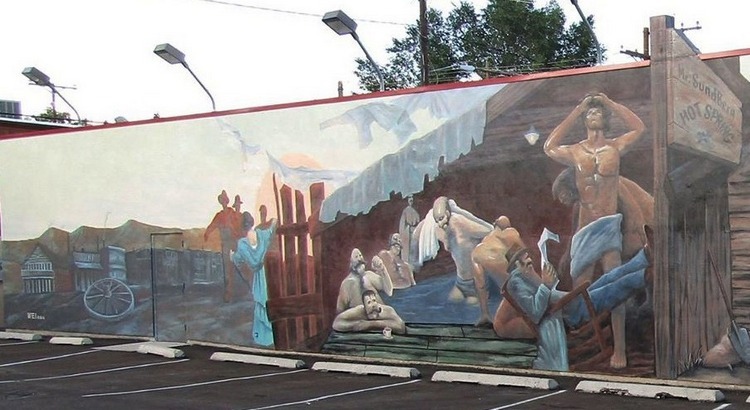 Located at 696 Aultman Street, on the west side of Economy Drug Store, the mural was commissioned by the Ely Renaissance Society during the summer of 2000 and is the subject of the first Living Mural Production. Study the artwork done by Wei Luan as it depicts the old gold mining town of Cherry Creek and the Hot Springs resort and laundry operation. 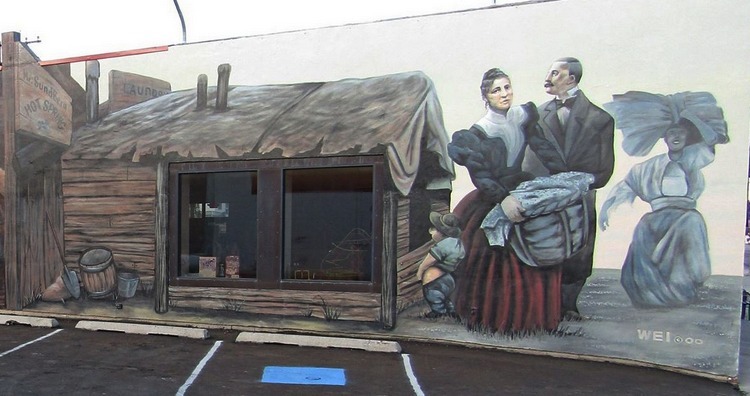 The Cherry Creek Mural tells the story of the Sundberg family, who settled in Cherry Creek in the late 1800’s. They came from Sweden and Denmark and were familiar with hot springs enjoyment and created a “spa” bath at the hot springs for the early miners. They also did their laundry. Telling the story of one Northern European family, this mural follows our theme of “Where the World Met and Became One.” The plaque on the wall at Economy Drug goes into more detail. The mural was the third done in Ely’s downtown in 2000 by Wei Luan. The refreshment of the mural was done by One Bear Productions of Las Vegas. Economy Drug paid for half of the refreshment cost, and a grant from Great Basin Heritage Area Partnership paid the other half. The work was done to carefully follow the original artist style and paint colors. One Bear Productions also did the Lehman Cave mural on the Park View Motel in 2016. The brochure for the mural trail has more information on Ely’s murals. The Ely Renaissance Society was formed in 1999 to preserve and renovate the downtown area through art that tells of our history. Recognizing the richness of Ely’s history, the Society choose the theme “Where the World Met and Became One,” which tells the story of the various ethnic groups who came to Eastern Nevada to work in the mines, ranches, and businesses. These groups brought a rich diversity to this community. Using White Pine’s unique historical theme to create giant canvases of art in the form of murals, the project sparked a sense of pride and revitalization to the community. During the summer of 2004, the Ely Renaissance Society hosted the Global Mural Conference. The Renaissance Society believes the outdoor art in the murals and the sculpture park should be as diverse as the history that it depicts. The artists have been chosen not only for their outstanding talent but also for a variety of artistic styles ranging from abstract impressionism to trompe l’oile. By combining history with art and placing it in the outdoor domain, accessible to all, art becomes a part of everyday life. The history lessons expressed on the walls ensure that our mining and ranching heritage is forever enshrined. Two new murals were added in 2016. One tells the story of Absalom Lehman and his discovery of Lehman Caves. The National Park Service celebrated its 100th anniversary in 2016 and the 75th Conference of the National Speleological Society meet in Ely, both to celebrate Lehman Caves as part of Great Basin National Park. The second mural, “Where the World Met and Became One,” recognizes the ethnic heritage of the area and features people and art of their cultures. These pieces of artwork were done by talented high school students. Information about all the Ely Renaissance Society projects can be found at www.elynvarts.com and atruralnevadanews.com.